There’s a careful balancing act that needs to be maintained when putting together any system. Cooling requirements need to be kept in check by size constraints, performance ties into both of those as well, and let’s never forget the almighty dollar. Various other elements are also at play like build quality, aesthetics, and other extras. Generally speaking, it’s impossible to build a single product that will get every area right for every person out there, and so we end up with the usual give and take. Acer’s Aspire V7 laptop is an interesting mainstream offering that won’t be the fastest system out there, and it’s not the lightest laptop you’ll find either; in fact, the list of what it’s not is almost as long as the list of what it is. The sum however ends up being greater than the value of the parts, and overall it’s a good laptop. Acer spent a couple decades chasing the budget sector, with every new release appearing—at least to me—to go ever more after cutting BoM costs with little to no regard for quality. We've complained about this, sometimes vigorously, and we’re happy to report that it seems like finally we're starting to get something new out of the company. Sometimes the results are good and sometimes not, but at the very least we won't fault the company for trying. 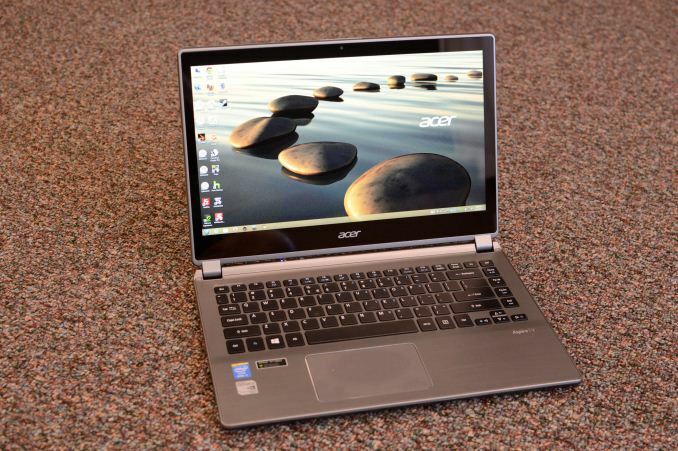 Look at the Acer S7 Ultrabook and their R7 hybrid to get an idea of what we're talking about. The keyboard on the S7 didn't win me over, but damn was that a thin laptop, and overall quality was quite good as well. As for the R7, the Ezel hinge and 15.6" quality 1080p display are something new and different, and though battery life was on the low side the concept of sliding the keyboard forward and moving the touchpad back in order to bring the touchscreen into the limelight is something at least a few people really liked (and others despised). But not all of Acer’s laptops have been quite so revolutionary; to discuss the V7-482PG we really need to go back a couple generations to the Acer M3. The Acer Timeline U M3 was the first chance we had to play with an NVIDIA Kepler GPU, which launched first on a mobile device. It delivered reasonable graphics performance and was a decent looking laptop overall, but there was a problem: the display was YAGTNP: Yet Another Garbage TN Panel. Seriously, the situation has become so dire over the past ten years that we need an acronym to describe the problem! And Acer's not alone in using these displays—ASUS, Dell, HP, Samsung, Sony, Toshiba, and pretty much every other laptop vendor has done the same thing at one time or another. And it’s not just the low quality TN panels. Shipping 1366x768 resolution displays might not be too bad on an 11.6” laptop, even though I’d really prefer to ditch the 16:9 aspect ratio and go back to 16:10; I might even excuse 1366x768 on a 12.1” screen. But at 13.3” and 14” I really think we need to at least have more options for something slightly higher resolution, and by the time we’re looking at 15.6” displays we absolutely should see 1600x900 at a minimum. 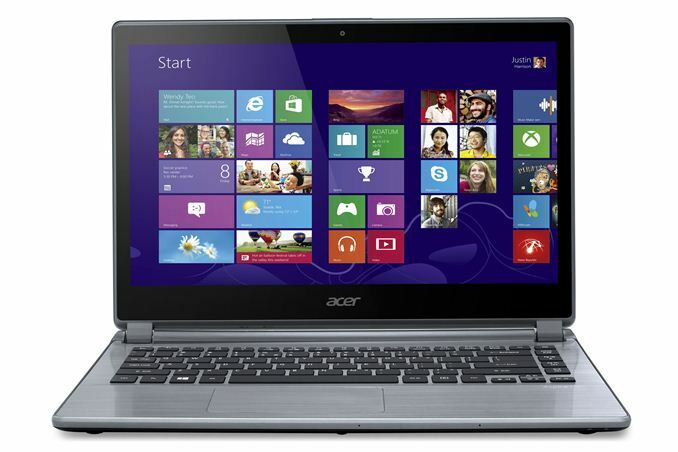 The core idea is the same is the Acer Timeline U M3 (which was later updated to the M5-481TG-6814): use a ULV/ULT processor with a midrange NVIDIA GPU to deliver a nicely balanced Ultrabook that can handle games while at the same time delivering good battery life, and package all of this into a thin and light chassis. We’ve looked at a few other laptops that try to do something like this; the Razer Blade 14 is all about the design and build quality, and Razer stuffs a 35W quad-core processor and a GTX 765M into a chassis that flirts with Ultrabook specifications. MSI’s GE40 has lower build quality and a slightly slower GTX 760M GPU in a thicker chassis, but it shaves about $600 off the price of the Razer Blade 14 in the process. Both laptops unfortunately have a major flaw: they have low contrast, low quality TN panels. That might be permissible on a budget laptop, but on premium devices we demand more. Acer’s V7 isn’t going to be as fast as the Blade 14 or GE40, what with the dual-core i7 ULT processor and GT 750M DDR3 GPU, but the display trumps the other options in a big way—and it’s even a touchscreen, though that still comes with the usual caveat that if you use the touchscreen you’re going to have to deal with lots of fingerprints. Basically, it’s a refined M5, with a Haswell upgrade, and the build quality is far better than you might expect from Acer. Or alternately, it’s a smaller, sleeker version of the Aspire R7 without the Ezel hinge and with the keyboard and touchpad in their proper locations, which means while I had issues with the R7, the V7 ends up being far better. And like the R7, it’s possible to open the chassis and upgrade the RAM and storage if you want – this time without any Torx screws hiding under the rubber pads silliness. The biggest drawback? The price is no longer even remotely budget; the M3 and M5 could be had for around $900, while the V7 is going to set you back $1300 – and that doesn’t even get you pure SSD storage, instead going with a slow 1TB 5400RPM HDD and a 24GB SSD cache using ExpressCache from Condusiv (which in our opinion continues to be not as good as Intel’s Smart Response Technology SSD caching). Right now, the only place I can find the V7-482PG is at Acer, and even that can be a bit tricky (it’s not directly accessible without searching the web in my experience); hopefully when we start seeing retail outlets carrying the laptop, the price will come down. If you’re after Ultrabook portability but want the option to handle games at moderate detail settings, there really aren’t too many viable alternatives. ASUS might update the UX32VD with a Haswell variant, but I’d be surprised to see anyone manage to put something faster than the GT 750M into a current generation Ultrabook, and the i7-4500U is about as fast as you’re likely to see as well (with the i7-4550U offering HD 5000 Graphics as an alternative for around $50 more). Let’s also not forget the 12GB of RAM this time—Acer went from 4GB soldered onto the M3/M5 generation and got dinged for it, so this time they’ve skipped 8GB and gone straight to 12GB, which thanks to Intel’s Flex Memory should provide the same performance as matched 4GB DIMMs while being better equipped for memory intensive workloads. +1 as I recently had to disassemble my old Dell Precision and one of the screws was too tight so it got damaged (the screw head hole is shallow compared to the screwdriver) and it starts to become almost impossible to remove (have to use a flat head screwdriver, but there's less and less to grab on).